The Grand Island Northwest Invitational always features some of the toughest Class B/C track & field competition in central Nebraska and Thursday’s 2010 edition was no exception. Boone Central Coach Kris Pestel was extremely pleased with the efforts by her teams in the difficult meet. While placing fourth in the girls team standings and seventh in the boys division, Cardinal athletes set 39 new personal-best marks for the season. “This is a tremendous meet to be part of because the competition level is extremely high,” Pestel commented. “We can be very proud of our girls and boys for their ‘never-give-up’ attitude and willingness to be competitive with the athletes next to them. “Our kids competed aggressively and to the best of their abilities in all aspects of track and field. “We again were led by our veterans, who give great leadership for our entire team to follow,” Pestel praised. “We continue to better ourselves, having 39 personal bests in this meet. The Boone Central girls had two winning efforts at Northwest – one individual and one relay – while scoring 80.5 points. Adams Central won the girls division with 111 points, followed by Aurora (94.17) and Northwest (87). The Cardinal boys tallied 23 points with one event winner. Aurora (182) ran away with the team title and host Northwest (99.5) edged Adams Central (96) for second. Senior Megan Bygland won the 300 meter low hurdles with her best 2010 time (48.9) and also placed third in the 100 meter highs, tieing her season best (16.7). The Cardinal 4-x-100 relay team of Jaime Kennedy, Savannah Baker, Breann Thorberg and Bobbi Beckwith took first with a season best 51.9 clocking. Beckwith had another strong all-around day, adding runner-up finishes in the 200 meter dash (PB 26.5) and 400 meter dash (PB 1:02.1) and helping the 4-x-400 relay to second place in 4:20.7. Kennedy, part of the two relays, added a pair of individual places, finishing third in the 100 meter dash (PB 12.8) and fourth in the long jump (PB 16’1). Thorberg was also on the 4-x-400 team and added a fourth-place showing in the individual 400 (PB 63.2). 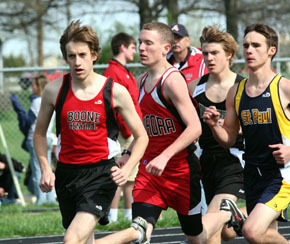 Senior Kevin Carder paced the Boone Central boys with a victory in the 3200 meter run in a 2010 best of 10:22.6. Carder was also runner-up in the 1600 meter run with a personal best 4:52.2. Also earning individual medals were Keenan Howell (pole vault, 6th, PB 11’7) and Blake Slizoski (100, 6th, PB 11.5). The Card 4-x-100 relay team of Dustin Christo, Slizoski, Zach Wurdeman and Lane Anderson placed fifth in 47.2 and the 4-x-800 squad of Tony Krohn, Jacob Lindgren, Cody Mangus and Wade Reigle ran their best 2010 time (9:20) while taking sixth.